...part of a golden generation of gifted Australians who enriched British life and world culture. Little in their [Australians] sunkissed insularity has equipped them for the ethnic and economic diversity of British arts and their focus is so short-term that only the most desperate of boards would, it seems to me, choose a second-string Aussie above a locally experienced, lifelong committed Brit. It makes no sense at all... The arts thrive on merit, and if an Aussie is the best candidate for any top job I'll be the first to put a chilled Chardy in their fist. But the Aussies are currently here mob-handed and mostly for the wrong reasons. Their country needs them more than we ever will. The message to these misfits is: Aussies, go home. Too much Mozart makes you sick... Mozart is a menace to musical progress, a relic of rituals that were losing relevance in his own time and are meaningless to ours. Beyond a superficial beauty and structural certainty, Mozart has nothing to give to mind or spirit in the 21st century. Let him rest. Ignore the commercial onslaught. Play the Leningrad Symphony. Listen to music that matters. I claim no credit for my headline. Ian Fenton suggests you add Norman Lebrecht as a friend on Facebook. Shorter Norman Lebrecht: I don't like Mozart, and since I'm the measure of all things, no one else should like Mozart, either. I don't know anything about this guy but these two snippets don't paint a pretty picture. He sounds highly xenophobic and completely oblivious. I'm not sure how one can assert that Mozart is too old and therefore irrelevant and then immediately suggest listening to music that, when he wrote the article, was over 60 years old because it "matters". Is age a measure of relevance or isn't it? I laughed so hard when I read this, I think I fractured a rib! 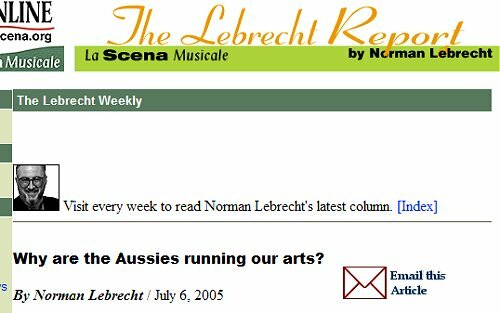 To JoshMc - Judging from what you write, you *do* know everything about this guy...there isn't really much else to say about Lebrecht. He can be fairly entertaining sometimes but he is a poison pen journalist notorious for not checking or deliberately twisting his facts. He wrote a completely nonsensical article about the recent big Mahler exhibition and how the Viennese never put on such an exhibition before (not true, there was already a very extensive Mahler exhibition and festival in 1960), how they never named a street after him (not true, the street right next to the Staatsoper is named after him), and other nonsense like that. Wonder if Lebrecht thought Mozart was Australian (an easy typo), this would comfortably tie together his two prejudices. Hilarious!